Tomorrow’s Doncaster Knights-Bedford Blues Championship clash at Castle Park (2.30pm) is a vital game for both clubs. 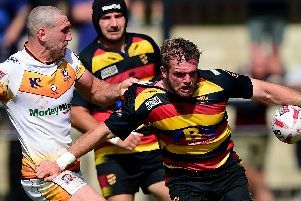 Knights, who complete their campaign with a trip to London Welsh next weekend, still need five points from their two remaining games to guarantee second spot. Blues could still finish third if results go for them over the next two games, but equally they could still be pipped for fourth spot by Jersey. “It’s going to be an interesting game because of what’s at stake for both clubs,” said Doncaster boss Clive Griffiths. Were both clubs to finish in the top four it would complete a remarkable change in fortunes for two sides who finished in the bottom four 12 months ago. “Bedford didn’t change their group much, as we didn’t, so you’ve got that continuity,” said Griffiths. “They also recruited some good players in key positions, as did we. “They play a good brand of rugby. I know (director of rugby) Mike Rayer very well and I know what he is all about and how he likes his sides to play. “Their fly-half Jake Sharp is a good leader and they’ve got Michael le Bourgeois in the centre who is like another No 10 for them.